If you are experiencing worse frame rates than usual with the Dolphin Viewer 3 on Windows, it may help to set the debug setting “CurlUseMultipleThreads” to true. Debug settings are in the Advanced menu, which you might have to enable first – to do that, go to Preferences->Advanced. In the next release this will be set as the default. Another update for the Dolphin Viewer 3: 3.0.7.20437. To derender someone/something, right-click on the avatar or object, the menu option is called “derender”. For objects it’s in the “Manage” submenu. Please note, once you leave the sim and come back, the avatar or object will be visible again. Downloads are on the download page. The newest version of the Dolphin Viewer 3 is out. The downloads are on the download page as always. UPDATE: There’s the possibility that the windows installer triggers that “Generic malware where we don’t exactly know what it actually is” alert from Avira Antivirus again. Let me just point out that neither avg nor f-prot have anything to complain about the file. I have to report three bugs in Dolphin Viewer 3. The performance on Windows can be abysmally slow, i.e. one third of what you’re used to (inherited from original 3.0 code). (reproduces in original RLV 2.7). Be assured that 2. and 3. are being worked on. Number 1. is in the hand of Linden Labs. What’s even worse is that 3. is also present in Dolphin Viewer 2 … and because I don’t have another spare PC I can’t maintain DV2 anymore, unless someone makes it build ok on Visual Studio 2010. Here’s a new Dolphin Viewer 3. Here’s a quick update for Dolphin Viewer 3. Find it on the download page as usual. I received a single user report that Avira anti-virus found a virus in DolphinViewer3-i686-Windows-3.0.3.20418.exe. After getting that report, I ran F-Prot, AVG, and ClamAV over the setup file, as well AVG and ClamAV across my whole build system, and they all found nothing. Avira, on the other hand, has been known “somewhat prone to false positives”. So there is no virus in there. The ‘virus’ that Avira is detecting in the Dolphin Viewer 3 installer is “ADWARE/Adware.Gen“. A generic detection routine designed to detect common family characteristics shared in several variants. This special detection routine was developed in order to detect unknown variants and will be enhanced continuously. I’ll send the installer to Avira to have it analyzed and properly scanned now. I’m getting word that other people have similar false positives with Firestorm, and the original Linden Labs viewers right now. It seems that there is something in the original code that upsets virus scanners. 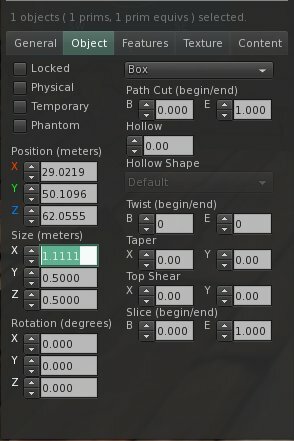 You can perform simple mathematics in the spinner controls in the Build tool’s Object tab (numeric fields in Position, Size, Rotation). For example, to double the length of a prim along the y axis you enter sy*2 in the y-size field. The other “variables” are px/py/pz for position, sx,sy,sz for size, rx,ry,rz for rotation. A new button in the Build tool is present, so that creators can create a sculpted prim directly instead of first creating a box and then changing it to a sculpt. Uploading mesh does not work – in fact it will make you crash. For now, use the official Linden Labs viewer to upload your mesh model. There is, as of today, no open-source library for mesh physics, which is needed to be able to upload mesh. Several people are working on a solution, and believe me, I’m monitoring the pertinent JIRA entries quite closely. If you crash in Dolphin Viewer 3, and get the message ‘You have been logged out of Second Life because you have been logging in from a different region’ when you try to log back in, use a non-mesh viwer to do so. After a successful log-in with a non-mesh viewer, you can use Dolphin Viewer 3 again. This issue is also present in the original viewer from Linden Labs, and to my knowledge is being worked on. Finally, any mesh-enabled viewer needs somewhat more memory than a non-mesh viewer. You might experience more frequent crashes because of that. I’m about to invest in some memory, and you may wish to also. I guess all that is left to mention is the usual: Find the downloads on the download page.